Since emerging on the contemporary music scene in the mid-1990s, tenor saxophonist/composer JD Allen has developed into one fine musician. He has recorded and toured with groups led by bassist Eric Revis, pianist Orin Evans, trumpeter Jeremy Pelt and drummers Cindy Blackman, Gerald Cleaver and, most recently, Jaimeo Brown. 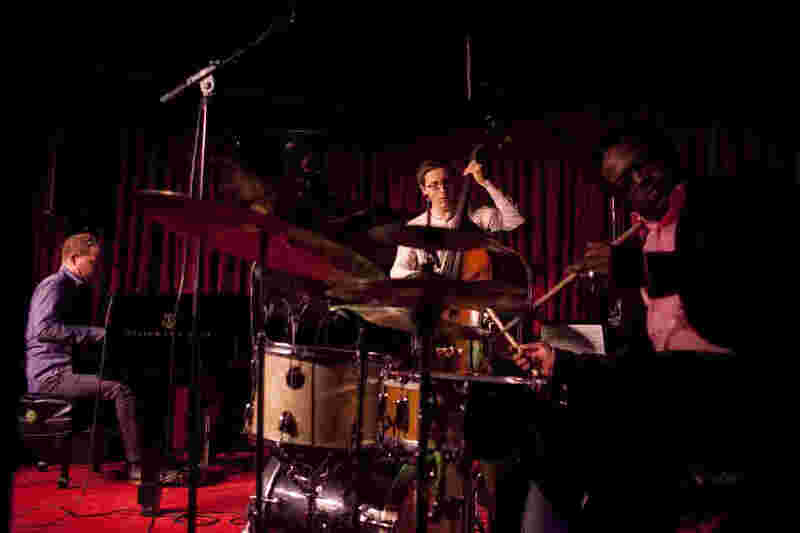 Over the past 5 years, Allen has led a trio with drummer Rudy Royston and bassist Gregg August that produced 4 CDs for Sunnyside and Savant, recordings packed with short yet powerful statements. Reviewers and critics consider musician/composers such as Max Roach and Charles Mingus - to my ears, Allen's Trio recordings show the composer as a poet, a master of musical haiku. "Grace", JD Allen's 2nd release for Savant Records, introduces his new ensemble, a quartet featuring bassist Dezron Douglas and drummer Jonathan Barber (both from the burgeoning Hartford, CT, music community) plus pianist Eldar Djanigirov. Allen has not recorded, as a leader, with a pianist since Orrin Evans appeared on his 2002 Criss Cross CD, "Pharoah's Children." Instead of a majority of tracks under 4 minutes, 9 of the 11 Allen originals on the CD are over 5 minutes. Yet, this quartet never wastes its time - Allen has created a program that has great melodies and fine solos, allowing the rhythm section an equal role in the construction of each performance. As for Eldar, he brings a fascinating voice to the proceedings, displaying the sound of Herbie Hancock and Andrew Hill in his accompaniment on tracks such as "Cross Damon" and "Lode Star." Unlike many of his own solo recordings, his playing here is sparse, mostly unadorned, less reliant on his brilliant technique and more on his interaction with his bandmates. Several of the tracks on "Grace" have a basis in astronomy (along with those already cited, there is also "Luke Skywalker" and "Pole Star") while others have a religious intent in their titles (such as the title track, "Mass" and "Selah.") Allen divides the program into "Side One" and "Side Two" yet this music flows easily from one piece to the next. If you listen closely to the piano and saxophone, you can hear them share or repeat phrases from the "theme" section in their solos. Also, I am so impressed with "free swing" of Douglas and Barber - they are the pulse and wit of this fine program. 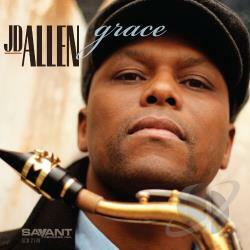 With "Grace", JD Allen has opened a door into a new and intriguing room in his musical house. For more information, go to www.jdallenmusic.org/. For the better part of his career (almost into its 4th decade), trumpeter Wallace Roney (53 years old on May 25) has been compared to Miles Davis (with whom he studied for a number of years.) That may have flattering once upon a time but now it's quite obvious from his numerous recordings as a leader and sideman, Mr. Roney is his own man. Since his move to HighNote Records in 2004, the musician and composer has also taken on the role of mentor, a position that he takes seriously and that liner notes writer John Kelman makes sure to stress. With his new release, "Understanding", Roney introduces bassist Daryl Johns (16 at the time of the recording) and welcomes pianists Victor Gould and Eden Ladin as well as saxophonists Arnold Lee and Ben Solomon into the fold - this is drummer Kush Abadey's 3rd CD with the trumpeter. "Understanding" is also Wallace Roney's first all-acoustic recording in over a decade. Yet, that does not imply the music is a move backwards (or lateral) - the concentration here is on group interplay and interaction with material ranging from 2 pieces each from McCoy Tyner and Duke Pearson, one each from the leader, Solomon and Lee plus the striking title track from the pen of drummer Roy Brooks (1938-2005). Roney's contribution is the hard-bop flag waver "Combustible" that serves as a vehicle for John's fiery solo as well as a fine solo from pianist Gould. Lee's "Red Lantern" also is a hard-nosed track with the front line (trumpet and 2 saxes) flying atop the wondrous propulsion of Johns and Abadey (there's a real connection to the late Tony Williams is this drummer's forward motion and cymbal work.) Solomon's contribution, "Kotra", makes a direct connection with the Miles Davis Quintet of 1964-69, in its opening theme and medium tempo that always seems to be ready to break loose. Roney breaks out the mute for the sweet version of Tyner's "You Taught My Heart To Sing" and, after his short but heart-felt solo, allows Solomon and Gould to step forward for longer, more involved, solos - don't miss the strong cymbal and musical bass lines beneath the soloists. Pearson's "Is That So?" starts slowly bit soon picks up a head of steam led by the forceful trumpet solo. Lee, Solomon and Gould keep the fires stoked, propelled along by Abadey's insistent drive. The more I listen, the more I can visualize this band on stage or in a nightclub setting. Though all but one of the tracks are over 6:50 seconds, this music does not overstay its welcome. Wallace Roney sounds fine throughout, his young charges impress with their energy and hard work, making "Understanding" a fun and worthwhile listening experience. For more information, go to www.wallaceroney.com. The Firehouse 12 Spring 2013 Concert Series rolls into May with the Craig Taborn Trio appearing Friday 5/3 for 2 sets. Taborn, bassist Thomas Morgan and drummer Gerald Cleaver have been a unit for several years and have recently released their debut CD for ECM Records, "Chants." The music ranges from the cerebral to hard-edged and all points in-between. Taborn, who has worked with many fine contemporary artists including Roscoe Mitchell, Chris Potter and Tim Berne, composes pieces that involve all the players in the musical conversation. Thomas Morgan has worked with Paul Motian, David Binney and Steve Coleman while Cleaver is both a bandleader and sideman, working with the likes of Mario Pavone and Jeremy Pelt. The Taborn Trio plays at 8:30 and 10 p.m. - for ticket information, go to firehouse12.com or call 203-785-0468. The performance space is located at 45 Crown Street. Next week, the Firehouse welcomes the Jeremy Pelt Show. The first time pianist Alon Nechustan was scheduled to play The Buttonwood Tree, Middletown and the rest of the state was covered in several feet of snow. He and his Trio - Shareef Taher (drums) and Javier Moreno Sanchez (acoustic bass) - will come to Middletown and The Buttonwood this Saturday May 4 for an 8 p.m. show. All goes well, this performance will not be canceled due to inclement weather. His music is a smart blend of mainstream jazz, Middle-Eastern influences, classical music and more. He's also a fine pianist whose solo work is rhythmically forceful while also quite melodic. The Buttonwood is located at 605 Main Street - for more information, go to www.buttonwood.org or call 860-347-4957. It's hard to believe that bassist Charnett Moffett has been a professional musician nearly 4 decades and he is only 45. His father, the drummer Charles bought him his first bass (half-sized) when Charnett was 7, took him on the road a few months later with the Moffett Family Band and he's been at ever since. At the age of 16, he left school to tour with Wynton Marsalis and that group recorded the classic "Black Codes From The Underground" in 1985. The bassist went on to work, tour and record with guitarist Stanley Jordan, drummer Tony Williams, pianist McCoy Tyner and vocalist Melody Gardot. Charnett Moffett's 10th CD as a leader is titled "The Bridge: Solo Bass Works" (Motema) is a 20-song tour-de-force and, yes, it's all solo save for a few overdubs. The material ranges from Thelonious Monk to Miles Davis to Mercer Ellington to Charles Mingus (a rousing "Haitian Fight Song") to The Beatles ("Eleanor Rigby") to Sting ("Fragile") to pieces by former employers such as "The Slump" (Tony Williams) to "Walk Spirit, Talk Spirit" (McCoy Tyner) and Marsalis's "Black Codes." Add to those pieces 8 original pieces and a gospel tune paired with a newer work from Adele and you've got quite a range on this program. Though one might state that "The Bridge: Solo Bass Works" is a primer for bassists and other musicians or fans of Black American Music can pass it by, don't miss this highly entertaining and musical recording. Charnett Moffett's playing is imbued with great spirit and soul. A first-class treat! - for more information, go to charnettmoffett.net. Often when one reads about saxophonist/composer Dayna Stephens, the articles talk about his need for a kidney transplant - for the record, you should go to helpdaynastephens.org and read more about his journey. Despite occasional extended hospital stays, Stephens is one of the busiest musicians around, working with groups led by Jeff Denson, John Heard, and pianist Taylor Eigsti while recording with bassist Linda Oh, pianist Gerald Clayton, vocalist Gretchen Parlato, trumpeter Erik Jekabson and others. He's released 4 CDs as a leader and his 5th, "That Nepenthetic Place" (Sunnyside Records) is a worthy addition to his catalog. With a working band of Eigsti, bassist Joe Sanders and drummer Justin Brown plus Ambrose Akinmusire (trumpet on 7 of the 10 tracks), Jaleel Shaw (alto saxophone on 5 tracks) and Ms. Parlato on 2 cuts, Stephens creates a program (8 originals and 2 "covers") that is filled with penetrating melodies and stunning musicianship. 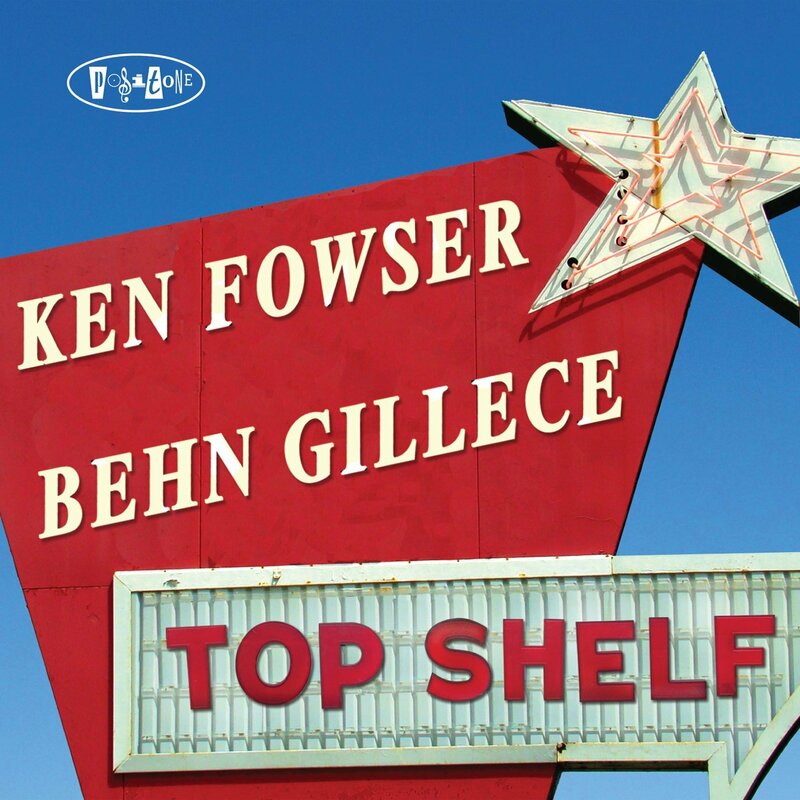 The interplay of the rhythm section with the soloists ignites many of the tracks; Brown's active snare and cymbals, Sander's well-placed counterpoint and Eigsti's colorful supporting chords continually stand out. The 2 quartet tracks - "Common Occurrences" and "A Walk In The Park" - are programmed back-to-back with the former an absolutely blazing performance while the latter is somewhat slower yet with a finely wrought theme (Eigsti overdubs electric piano that comes and goes through the course of the piece. Ms. Parlato adds her breathy voice to the delectable take on the Van Huesen/Burke classic "But Beautiful." Stephens' tenor also displays a breathy quality, with a bow to Stan Getz in his short but strong solo. The vocalist, along with Akinmusire, also joins the band for the impressionistic original "Wink Wink"; the wordless vocal rises with an urgency out of the rhythm section pushing the musicians on a slightly different and more forceful tack. Akinmusire and Shaw join Stephens on the delightful take of John Coltrane's "Impressions", the longest track on the CD at 11:40. The trumpeter sets the pace on the opening solo, blending his rapid-fire phrases with the sprightly walking bass and driving drums. Eigsti follows, building off the trumpeter's energy with his own fiery spot. Stephens continues the fiery pace until Shaw slows the music down for his keening lines. All the while, Sanders and Brown dance beneath the soloists with gleeful abandon. Stephens' ear for catchy melodies and creative arrangements never lets up, culminating in the Charles Mingus-like flavors that permeate the final track, "Dr. Wong's Bird Song." Sanders' bouncy bass lines and Brown's snappy snare lead the way, enlivening the track and also helping to add to the "mysterious" feel. 2013, to this writer, is shaping up to be a most impressive year in both Black American Music and Modern Classical. "That Nepenthetic Place" is one of the best new releases, with music that continues to open up to the listener each time he or she sits with the program. Even better, the program reverberates long after the final notes fade away. Dayna Stephens and his fellow friends/musicians truly deliver - for more information, go to daynastephenssound.com. Also, if you have not heard his fine 2012 Criss Cross CD "Today Is Tomorrow" (recorded with a totally different septet), find that recording as well. Pianist/composer/arranger and educator Earl MacDonald (he's on the faculty of the University of Connecticut/Storrs) leads and plays with the Hartford Jazz Society's New Directions Ensemble. The nonet (listed below) plays at 8 p.m. Friday April 26 in the Polish National Home, 60 Charter Oak Avenue, Hartford. Scheduled to appear with the NDE are Kris Allen (alto saxophone), Frank Kozyra (tenor saxophone) and the fine young baritone player Lauren Sevian as well as trumpeters Tony Kadleck (a mainstay of the Maria Schneider Orchestra) and Josh Evans, Shelagh Abate (French horn), Sara Jacovini (trombone), Henry Lugo (bass) and Ben Bilello (drums). This is a formidable ensemble and one expects the music to really shine. Opening the show will be the excellent Newington High School Jazz Ensemble. For tickets and more information, go to www.hartfordjazzsociety.com or call 860-242-6688. Guitarist/composer Sinan Bakir returns to The Buttonwood Tree, 605 Main Street in Middletown for a Trio gig at 8 p.m. Joining him will be Jen Allen (keyboards) and the fine young drummer Cemre Dogan. Thanks to his busy schedule of live dates, Bakir's playing and musicianship has truly matured over the past 18 months or so. Since I first heard him play 3 years ago, he has become a stronger soloist, more melodic and forceful yet gentle when the music calls for it. He's also a fine accompanist. For ticket information, go to www.buttonwood.org - to find out more about the guitarist, go to www.sinanbakir.com. Also on Friday night (this is beginning to look like listing for New York City), vocalist Giacomo Gates performs as part of the Music@Japanalia Series, located at Japanalia Eiko II, 11 Whitney Avenue in Hartford. 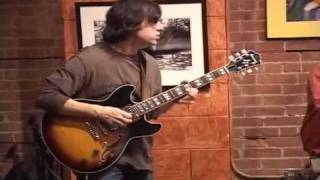 Gates, who just released, arguably, his best CD "Miles Tones" on Savant Records, performs with guitarist Tony Lombardozzi and bassist Jeff Fuller. The concert, titled "Mostly Miles", will foecus on material from the recording and, in this intimate setting, one will be able to hear what a great job Gates does blending the lyrics into his interpretations of solos from a number of Davis's albums. For ticket information, call 860-232-4677. Movies often glorify war; most, especially modern movies, do not shy away from the violence that war begets. Music, however, often takes sides whether it be the flag-waving favorites of the 2 World Wars or the harsh anti-Vietnam screeds of the late 1960s. Composer David T. Little interviewed a number of soldiers from the various wars that the United States has been involved in over the past 5 decades. Using excerpts of those interviews as his libretto, Little has created "Soldier Songs" - the music, now released by Innova Rcords, is performed by Newspeak, the ensemble Little has worked with (percussion, vocals) and composed for over the past 6 years. That octet features Caleb Burhans (violin), Mellissa Hughes (voice), James Johnston (piano, keyboards), Eileen Mack (clarinet, bass clarinet), Brian Snow (cello) and Peter Wise (vibraphone, percussion). (Newspeak guitarist Taylor Levine is not on the recording.) Added to the ensemble for this production are Kelli Kathman (piccolo, flutes) and lead vocalist David Adam Moore (baritone), all conducted by Todd Reynolds. The multi-media production debuted in June 2011 at the International Festival of Arts & Ideas in New Haven, CT. The reviews were (mostly) positive and Little set about recording the music. Needless to say, much of the music is dark, harsh, and grating (like the combat scenes it represents) yet the power of the compositions, Moore's expressive vocals, and the ensemble's precise work shines on this recording. While the lyrics do not pick out any particular politician, government or guerilla organization, they do speak to the dreams and frustrations of the men and women who do the "dirty" work"of those who call the shots. As the program progresses from the dreams of young boys playing soldier in the backyard to the various war zones to the aftermath (how we inform families of the loss of their children and how we remember the fallen) to the inevitability of war breaking out around the war, one hears the people that Little has interviewed. Music can not stop war but pieces like "Soldier Songs" can inform those of us in the safety of our homes of the sacrifices of those people we send to fight for us and the families they leave behind. The memories of combat do not, can not, leave the minds of those who are involved - David T. Little reminds us to listen to those people, to pay attention to the families, to make sure we never grow "cavalier" about what war really is - war is killing, plain and simple Neither glorious nor beautiful, wa is death. This is powerful music and deserves your close attention. For more information, go to davidtlittle.com/projects/soldier-songs/. The first sound you hear on "Native Informant", the striking new Naxos CD of music by Arab American composer Mohammed Fairouz (born 1985) is the plaintive clarinet of David Krakauer, one of the brilliant players of the modern Klezmer music. The piece is "Tahwidah" (lullaby) and the text comes from a poem by Palestinian writer Mahmoud Darwish (1941-2008) - when soprano Mellissa Hughes adds her voice, the piece builds in emotion and intensity. Throughout the remainder of the CD, one often hears emotion, intensity, and sadness. Much of this music is informed by the composer's trip to Lebanon, once the 'jewel" of the Middle East, now a trampled ground of hopes, casualties, dreams deferred or denied. Fairouz sets 2 poems by American poet David Shapiro to music as well as 3 pieces by American Wayne Koestenbaum, both Jewish. Like the Middle East, Fairouz's music speaks to the centuries of Arabs and Jews living together under the rule of various emperors or nations. Nowhere does he speak about this but, if you know anything about the music of the Middle East, it is a fusion of many cultures that have or still reside there. But the music goes in so many directions. Violinist Rachel Barton Pine is featured on the 5-part title piece, a solo work that ranges from a celebration of dance to a lament to the many people killed in the Egyptian uprisings of 2010-11 to the plaintive lullaby that closes the work. The Borromeo String Quartet are featured on the expansive "Chorale Fantasy" and return on the 2-part "For Victims", accompanying baritone David Kravitz as he sings the Shapiro poems. Pianist Steve Spooner teams with baritenor Christopher Thompson on "Posh", the song cycle based on the Koestenbaum poems - the blend of darkness and light is quite lovely. The CD closes with the 5-part "Jebel Lebnon" (Mount Lebanon) commissioned and performed by Imani Winds. The music takes its direction from the disastrous Lebanese Civil War (1975-1990) and is marked by the blend of shrill piccolo and clarinet on the opening section ("Bashir's March") to the plaintive bassoon that opens "Ariel's Song", a lamentation to the massive loss of civilian life and dislocation in the conflict. Yet, the lightness of spirit that permeates "Dance and Little Song" and feistiness of "Mar Charbel's Dabkeh" points to the resilience and hopes of the nation. The best person to talk about this music is Mohammed Fairouz and he does so in this recent article on the Huffington Post (read it at www.huffingtonpost.com/mohammed-fairouz/native-informant_b_3119521.html.) My suggestion is find this music, soak in it, pay attention to its inner workings and the voices that emerge - it's an intense emotional journey but also quite educational. To learn more about the composer, go to mohammedfairouz.com. When guitarist Joe Morris and keyboard master Jamie Saft get together, they sure do know get one's attention. They have formed a band, called it Slobber Pup, recorded a CD for Rare Noise Records and now they are coming to New Haven this coming Tuesday April 23. With bassist Trevor Dunn and drummer Balasz Pandi, the quartet pushes against labels although the group's Facebook page describes the music as "Microtonal Blues from Below" and judging by the examples I have heard, that's an apt description. Slobber Pup will perform at Cafe Nine, 250 State Street in the Elm City. Opening the show at 8 p.m. will be the New Haven-based trio Subfloor - that group features Chris Cretella (guitar), Carl Testa (electric bass, "modular effects") and Dave Parmalee (drums). The house will definitely shake! For more information, go to cafenine.com/. To get a taste of Slobber Pup (now, that's an image), go to www.facebook.com/slobberpup. It's a "homecoming" concert this Friday (4/26) at Firehouse 12, 45 Crown Street in New Haven when saxophonist Wayne Escoffery comes to the performance space. Born in England, the saxophonist/composer moved to New Haven for his formative years (he was 11 years old when his mother decided to stay in Connecticut.) Thanks to saxophonist/educator Jackie McLean, he studied at the Artists Collective in Hartford, then went on to the Hartt School of Music and received his Master's Degree from the New England Conservatory in Boston. After graduation, Escoffery moved to New York City; his first major gig was with pianist Eric Reed's Septet. He has since gone on to work with the Mingus Big Band & Orchestra, Ron Carter's Great Big Band, Tom Harrell's Quintet and with his wife, the vocalist Carolyn Leonhart. He's released 7 CDs as a leader, appeared on dozens more and has found time to work with high school friends Noah Baerman (piano) and Amanda Monaco (guitar) in a project called Playdate. His most recent CD, "The Only Son of One" (2012, Sunnyside Records), is also his most personal, telling his life story in a series of instrumentals. Most of the group that appeared on the record will be with Escoffery in New Haven including pianist Orrin Evans, bassist Hans Glawischnig and drummer Jason Brown. Rachel Z (electronic keyboards) has replaced Adam Holzman for this tour. The Quintet will be playing 2 sets - 8:30 and 10 p.m - for ticket information, go to firehouse12.com or call 203-785-0468. I would not be surprised if this show sells out both sets, so don't hesitate to go online or call. To find out more about the saxophonist, go to www.escofferymusic.com. Guitarist/composer Sean Moran first came to my attention when the four bags issued its debut CD in 2001. The quartet's catchy blend of melody, improvisation, humor and impressive material stood out - the band, which features Moran, Michael McGinnis (clarinet), Brian Drye (trombone) and Jacob Garchik (accordion) released its 4th CD in October 2011, continues to create a unique sound. "Tusk" (NCM East Records) is the first CD by Moran's Small Elephant Band, a quintet that features 9 originals played by Moran (nylon string guitar), McGinnis, Chris Dingman (vibraphone), Reuben Radding (acoustic bass) and Harris Eisenstadt (drums). There are moments when the blend of acoustic guitar and vibes remind me of the music James Emery created in the late 1990s and early 2000s for ENJA and Between the Lines. Moran has created an intimate program, one that relies on his fine melodies, impressive arrangements and the intuitive interplay of his band. One has to pay close to attention to the different colors in pieces such as "Elliptical" that opens the program, to the call-and-response of the vibes and guitar underneath McGinnis as well as the full-toned bass and martial drumming on that tune. Moran's melodic ideas range from short phrases (like the forceful lines that open "Circle One, Two") and the Far-Eastern flavor of "Moon Reflected" - the latter piece changes direction almost immediately but pay attention to the interplay as all 5 musicians work to move the piece forward. "Tusk" bears no relation to the 1979 Fleetwood Mac double Lp of the same name - this, unlike the older recording, is a true group endeavor, one on which each instrument is as important as the other in the success of the program. Sean Moran's compositions and arrangements defy easy definitions or any labels; this is music of great imagination and intelligence, well worth exploring time and again for its creativity and the quality of the musicianship. For more information, go to sean-moran.com. This was one of those weeks when music served as a "healing force, helped to ease the pain of the tragic events in Boston and elsewhere. 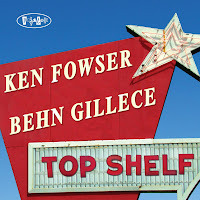 Driving home from work the other night, I put "Top Shelf" into the player; it's the 4th PosiTone Records release from the duo of Ken Fowser (tenor saxophone) and Behn Gillece (vibraphone) and the easy-going swing was a true panacea (sounding just as fine the next day and in the background as I write.) Featuring the classy rhythm section of Steve Einerson (piano), Rodney Green (drums) and Hartford, CT, native Dezron Douglas (acoustic bass), the leaders also invited trombonist Michael Dease to add his burr-ey sound to a number of the tracks. When Dease is in the group, as he is on the opening track, "Slick", the music has a resemblance to the music of the Jazz Crusaders (pre-funk). The blend of tenor and trombone really stands out as does the interaction of the vibes and piano. When you add in the smart work of Green and Douglas, the music really flies. "Stranded in Elizabeth" is an excellent example of the interaction and interplay. Green really pushes beneath the vibes solo while Einerson's Tuyner-esque supporting chords, along with the fine bass work, acts as a solid foundation for the soloists. There's a Latin tinge to "Unstoppable" as well as a snappy theme for the tenor and vibes. In a short YouTube video that accompanied the CD's release, the leaders mention the influence of Bobby Hutcherson's work with saxophonist Harold Land and it is most evident on tunes such as this one and the up-tempo title track. Green creates sparks beneath the hearty tenor solo and prods Gillece to produce one of his most notable solos on the recording. Again, Einerson's forceful chords and driving solo stand out. Over a couple of nights, the duo recorded a number of originals (3 each), 2 Thelonious Monk pieces), a piece by Lennie Tristano, a standard, an adaptation of a work by George F. Handel and an improvised original. Some pieces have overdubs, others just the 2 players; 2 pieces clear the 6 minute while 2 barely go past 2 minutes. The CD, released by Sunnyside on March 12 of this year, is titled "Small Constructions." Right around the release date, the duo played a series of live shows in the States and Europe during which the pieces on the recording plus others really came to life. For their Firehouse gig, Messrs. Wendel and Tepfer will play 2 sets, 8:30 and 10 p.m. (separate admission charges). For more information, go to firehouse12.com or call 203-785-0468. To learn more about "Small Constructions". go to sunnysidezone.com/album/small-constructions. On Wednesday April 17, the project known as Ninety Miles comes to Hartford. The ensemble, spearheaded by Stefon Harris (vibraphone), David Sanchez (tenor saxophone) and Christian Scott (trumpet), takes its name from the fact that the group came together in Cuba, just 90 miles south of Key West, Florida. Their self-titled debut CD came out in 2011 and really captured the ear with its savvy blend of Black American Music and Cuban-Caribbean rhythms. For the band's latest tour, Nicolas Payton is in the trumpet chair but I'm not quite sure who's in the rhythm section. Nevertheless, Ninety Miles is playing at 7:30 p.m. in the acoustically-fine Asylum Hill Congregational Church, 814 Asylum Avenue. For ticket information, call 860-278-0785 or go to www.ahcc.org. Some years ago, I reviewed a CD by saxophonist-flutist-composer Larry Ankrum for CADENCE. I remembering being impressed by the tome of his saxophone and his fine, not fussy, playing but then lost track of Ankrum. Seems he's been spending some time touring behind jazz, blues and Cajun artists as well as recording in New Orleans. His new CD showed up the other week; "The Dream Of the Ballerina" (self-released) features the splendid rhythm section of bassist James Singleton and drummer Kevin O'Day plus, much to my joy and surprise, pianist Joe Ashlar. Young Mr. Ashlar grew up in Middletown, CT (my hometown), the son of my good friend Joe Rybzcyk - I watched him grow up from a child prodigy to a working musician (and all the happiness and sorrow along the way.) His delightful, spare, melodic piano work on this CD is a pleasure to listen to. The impressionistic swing of "Le Chapeau de Monk" blends Thelonious with Crescent City rhythms - the piano solo starts with a few Monk allusions before Ashlar dances away. The blend of flute and piano on the opening "Best Friends" has both a gentle and harder edge; O'Day's dancing drums and Singleton's solid bass lines give the song its groove and direction while there's the feel of Abdullah Ibrahim in the piano chords. There's a late-40's- early 50's feel to "Champagne Moon", a delightful ballad that seems to channel Don Byas in the tenor and Teddy Wilson on the piano's opening theme. The rhythm section (minus the piano) drives like a runaway train on the hard-bopping "The Worse the Deed, the Better the Confession". O'Day is the main catalyst here, his expressive drumming pushing the saxophonist to dig deep on every phrase. He and Ashlar get into a tango groove on "Cartas de Suelta" and Ankrum's tenor dances with joy to their celebration. The piano solo has the feel of a rainstorm on a hot night, the notes falling all around the listener. The final 2 tracks, "The Silent Part of Your Soul" and "Searching For What You Never Lost", are group improvisations, the former starting slowly and building surely to a boil atop the dancing bass lines while Ankrum's tenor sax dances the latter piece in, prompting the ensemble to get into his sweet groove. The piece changes course several times through its 11+ minutes. After a lengthy bass solo, Singleton drops into a funky bass line and the band, led by Ankrum, ride it until the end. 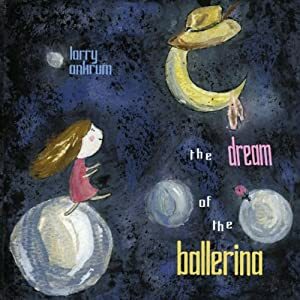 "The Dream of the Ballerina" should satisfy those listeners who dig a groove but also like an ensemble that takes chances yet can play it straight. It's good to hear Larry Ankrum playing so well (and displaying fine flute "chops") and his band truly shines. Go to www.larryankrum.com to find out more. Sony/Masterworks has revived the Okeh label, a company that began life in 1918 to issue "ethnic" recordings ranging from German to Polish to Yiddish. But, the label really made its reputation releasing "race" records for the growing African American communities in the industrial big cities of the Northeast and Midwest. Arrtists such as Sidney Bechet, Mamie Smith, Louis Armstrong and Duke Ellington issued 78 rpm records on the label. Columbia bought the company is 1926 and has owned the name ever since. They hit it big in the 1950s with Johnny Ray and again in the 60s and early 70s when they hired Curtis Mayfield to produce the likes of Major Lance and Larry Williams. Okeh came back to life in the 1990s with artists such as G.Love and Special Sauce, Keb' Mo and Little Axe but disappeared in 2000. Okeh is back in 2013 and it's first release is a solo recording by John Medeski (yes, he of MM&W). Titled "A Different Time", Medeski recorded the program on a 1924 Gaveau piano. Built in France, the instrument has a delicate sound and Medeski responds with a program that is meditative, highly melodic and strongly impressionistic. 7 of the 9 songs are originals with the exceptions being a sweet and ever-so-slow reading of Willie Nelson's "I'm Falling In Love Again" plus a fine arrangement of the Gospel classic "His Eye Is On the Sparrow." Medeski's "Luz Marina" shows the influence of Erik Satie in its chord patterns and gentle melody while "Lacrima" opens with notes that seem to drip from the pianist's fingers. "Ran" has a darker quality, not unlike the minimalist style of Mr. Blake for whom (I believe) the song is written. In his liner notes, John Medeski hopes "that this recording can be listened to late at night, when social responsibilities are over...when all need and wants have been put to momentary rest....when you are tired of words, when you are ready to yield to the sounds of these simple contemplations for the Gaveau." Don't come to this CD expecting the explorations of Martin, Medeski and Wood. Quiet, gentle, somber and peaceful, "A Different Time" is a balm for bad days, for sadness, to be listened to with the lights dimmed (or totally out), alone or with a person you love. For more information, go to www.johnmedeski.com. Saxophonist/composer Jasmine Lovell-Smith (pictured left) came to Middletown late last August to begin her post-graduate studies in composition at Wesleyan University. The New Zealand-native already had recorded her first North American CD as a leader, had done a bit of touring but felt the need to deepen her skills and knowledge. 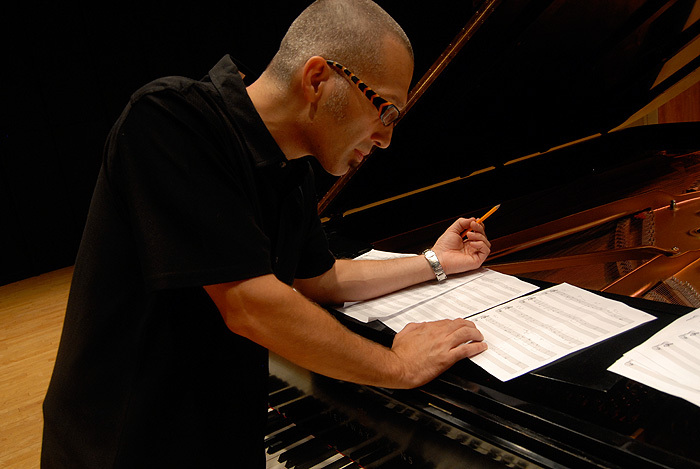 Clarinetist Nathan Friedman (pictured below), a native of British Columbia, came to Wesleyan at the same time to study composition and experimental music, having already worked with Professor Anthony Braxton when the famed composer and conceptualist came to Vancouver in 2010 to perform his "Sonic Genome Project." This Saturday evening (April 13), Ms. Lovell-Smith and Mr. Friedman blend her soprano saxophone and his clarinet for a duo concert as part of the Uncertainty Music Series, the New Haven-based Creative Music program curated by Carl Testa. Also on the bill is guitarist Chris Cretella , a New Haven resident and recent graduate of the New England Conservatory of Music, who will perform a set of solo pieces. His new CD, "Going Nowhere", is a collection of solo works, the first time the guitarist has recorded in a solo setting. The event takes place at 8 p.m. in the performance space of Never Ending Books, 810 State Street - for more information, go to uncertaintymusic.com. Firehouse 12, 45 Crown Street in New Haven, welcomes the creative music quartet Conference Call for 2 shows on Friday April 13. The foursome - Gebhard Ullmann (reeds), Michael Jefry Stevens (piano), Joe Fonda (bass) and George Schuller (drums, percussion) - last played the Elm City performance space/ recording studio in September of 2008 but don't expect to hear a repeat of those sets and that music. All 4 are composers and continually update the band's repertoire. Do expect to be surprised by the varied sounds of Ullmann's saxophone and clarinet playing, by the way Stevens constantly probes and works within the arrangements, at Fonda's strong bass work and outgoing personality and Schuller's playful as well as forceful percussion. Conference Call plays at 8:30 and 10 p.m. (separate admission charges) - to find out more, go to firehouse12.com. Guitarist/composer Frank Varela heads a double bill this Friday at The Buttonwood Tree, 605 Main Street in Middletown. The Berklee School of Music graduate has worked with the likes of organist Jimmy McGriff, drummer Max Roach and the great banjo master Tony Trischka. Joining him are bassist Bob Laramie and drummer-vocalist Rick Marshall. The trio's music is a blend of jazz and rock influences, leaning more towards the former but with audible traces of the latter. Opening the show at 8 p.m. will be pianist/vocalist Avi Wisnia. Wisnia has a charming voice and his music shows the influence of several Brazilian composers. Organist/composer/arranger Brian Charette released one of my favorite CDs of 2012, "Music for Organ Sextette" (SteepleChase Records). He created an impressive repertoire for his group that features his organ, drums and 4 reed players. Well, he's written more music for the groups's next CD and will be playing it live on Wednesday April 10 and Thursday April 11 in Smalls, 183 West 10th Street in New York City. The Sextette will play from 9:30 until 12 midnight and you should be able to watch the show live online at www.smallsjazzclub.com (you have to join the website to view the clubs stream.) To learn more about the organist and his projects, go to www.kungfugue.com. Pianist-composer Shamie Royston, who works in her sister Tia Fuller's band, is one of the many musicians from the Denver, Colorado area. Married to the insanely busy (work-wise) drummer Rudy Royston and the mother of 2 children, she is beginning to step out on her own. "Portraits" (self-released) is her debt CD as a leader and, judging by the contents, will not be her last. Ms. Royston's melodies and arrangements capture the ear with their maturity plus her musicianship shines as well. Doesn't hurt one bit that husband is the drummer on the recording - his multi-rhythmic approach sparks the up-tempo pieces while his brush work on the slower pieces is tender and, at times, quite melodic. Bassist Ivan Taylor is the foundation of this music, holding down the tempi so the drummer can explore the different avenues his creative mind likes to take. On pieces such as "Summer in Central Park" (a Horace Silver composition and the only non-original on the disk, it's a treat to listen to the interactions of wife-and-husband while the bassist stays the course. Ms. Royston sets the pace on the opening track, "The Beast Within" but it's Mr. Royston who takes the title to heart as his rollicking drum work pushes the piece forward and his explosive work beneath the piano at the close actually sets the tone for the following track, "Run." Before the close of that tune, his fiery work literally lifts one out of his seat. Now, there are plenty of piano trio recordings on the market (seemingly dozens every month) but few with the exquisite interplay and sense of dynamic variation that inhabits "Portraits." Close your eyes on the quieter tracks and listen to how the musicians are listening to each other. When vocalist Camille Thurman joins the trio for the pretty ballad, "In This Quiet Place", the accompaniment is gracious and graceful, allowing the vocalist the freedom to move beyond the melody into a soaring wordless flight of human sound. The stunning solo piano piece "Healing Hymn" is dedicated to the pianist's parents; Ms. Royston opens the piece in one graceful mood and then shifts into the more formal reading of the traditional "Yes Jesus Loves Me." Don't be shy. Go out and find "Portraits", play it loud in the living room and quiet late at night, when you rise in the morning and as you walk through the woods. Joy, love and jazz in motion - emotionally rich, the music of Shamie Royston touches the heart. For more information, go to www.shamieroyston.com. The first sound one hears is a voice singing "This world, this world is a mean world to live in, to stay in." Before long, the cymbals rise up beneath the singer, then the tenor saxophone and harp-like guitar sounds as the drummer beings to drive the music. Welcome to "Transcendance" (Motema Music), the fascinating new work from drummer/composer/sound explorer Jaimeo Brown. The son of bassist Dartanyan Brown and pianist/woodwind player Marcia Miget, Brown has played with the likes of Steve Wonder, Carlos Santana, Q-Tip, Geri Allen, Greg Tardy and Bobby Hutcherson. For his debut as a leader, he builds his music off the work of the Gee's Bend Singers, a Gospel group from Alabama whose community is also known for artistic quilting. Their voices, recorded (in some instances many years ago) permeate the music, giving Brown and his "regular" bandmates J.D. Allen (tenor saxophone) and Chris Sholar (guitar) the framework to build their explorations. Several tracks include the Asian Indian voice of Falu; her impressive interaction with the Gee Bend Singers on the traditional spiritual "I Know I've Been Changed" is other-worldy, with a middle section where the trio moves into a South Indian rhythm. Brown's mother adds flute to the trio (plus voice) improvisation of "Be Free." Right in the middle of the program is the splendid 2-part "Power of God"; the first half of the 7+ minute track features the Gee Bend Singers over a fast-paced drum accompaniment and, when you listen closely, the quiet and stately piano of Geri Allen. After the voices and drums drop away, Ms. Allen hews closely to the melody and chords for her solo meditation. Ms.Allen also join the trio for the prayer-like Brown original "I Said" which closes with the voice of his 2-year old daughter Selah singing the melody line. There are numerous magical moments on this CD. The drums-tenor saxophone duet built around the "testifying" Gee's Bend vocal on "You Needn't Mind Me Dying" plus the trio and bass meditation (the drummer's dad supplies the bass) on "Patience" stand out for their emotional depth and sonic excitement (the processed vocals rising out of the improvisation at the end of the track is hair-raising.) The blues-drenched guitar work of Sholar on "You Can't Hide" and the hard-pounding drums blend well with the Gee's Bend voices; Allen's tenor work initially has the blues feel and follows the melody line but his solo is a melodic yet forceful statement of faith. "Transcendance" is glorious, a project that illustrates how music can be built off the traditions of the past without watering it down or ignoring its original intent. In his liner notes, Jaimeo Brown writes that "global corporations and bands are destroying local cultures throughout the world." Other people worry about the indifference of younger generations to the less dominant cultures and indigenous art. Brown also writes "Hope is what flows out of the heart of these spirituals." Hope fuels the emotional responses in this most impressive project. For more information, go to jaimeobrown.com. What a treat! Two great musicians, explorers of the jazz tradition as well as players who exploded cliches and expectations. Tommy Flanagan (1930-2001) and Jaki Byard (1922-1999) each played a part in the advancement of Black American Music, the former appearing on a number of transitional recordings (John Coltrane's "Giant Steps" and Sonny Rollins' "Saxophone Colossus", to name but 2) while the latter worked with Charles Mingus and Rahsaan Roland in their groups and on historical recordings. "The Magic of 2" (Resonance Records) documents the pianists working together on February 7, 1982, in the midst of a gig at the Keystone Korner, Todd Barkan's club in San Francisco, California. Barkan, label owner George Klaban, and mastering engineer Fran Gala created this recording from a series of cassette tapes and, man, they have done quite a job. The 11 tracks (plus the club owner's "Introduction") include 5 duos and 3 solo pieces each with nary a clunker plus lots of vocal encouragement from the audience and the musicians. The duo come roaring out of the gate with a snappy reading of Charlie Parker's "Scrapple From The Apple" - the be-bop classic translates well to the stride stylings of both pianists (their left-hand work alone is highly engaging.) Later in the program, their delightful version of Tadd Dameron's "Our Delight" shows a distinct Duke Ellington influence in the chordal patterns yet the real highlight is their intertwined solo. Both pianists use the solo section to display their varied interests. Flanagan offers 3 works from Billy Strayhorn including a short but poetic reading of "Chelsea Bridge" and a joyous reading of "All Day Long." Byard, who could make any song swing and sing, chooses 3 very different pieces. His reading of Stevie Wonder's "Send One Your Love" moves from the beautiful to a knuckle-busting solo that fires up the audience. Even better, he builds the entire piece from the chord changes to "Giant Steps" (which also sounds close to the chord progression of "Central Park West.") Later in the program, he performs Chuck Mangione's "Land of Make Believe" which he gives an almost Wagnerian gravitas. His variations on the melody during the solo section goes from the ridiculous to the sublime (and back). One might think he's making fun of the jazz musician's "pop" hit but, really, he's "riffing" in the style of Jonathan Winters and Robin Williams. They are comedians (Byard had a great comedic side) who just take a theme and roll with it. Here, Bard is having fun by letting his mind and fingers run wild. Is it too early to hope that Mr Barkan and Klaban have more of this music stashed in their closets? The pianists have so much fun together and they make it fun for the audience. O, those lucky folks in attendance and, now, lucky us. What a treat! Seems like we plan to go away for the weekend and the number of fascinating musical opportunities increase dramatically. I realize it's just coincidence but, while we're in DC, the CT Composers and Improvisers Festival takes place in Middletown and Tomas Fujiwara returns to Firehouse 12 with The Hookup - that's just Friday. This is also the weekend of the 1st Annual Yale Jazz Fest, a 3-day event (4/05-07) headlined by a Saturday afternoon performance featuring the Vijay Iyer Trio. That concert takes place at 4 p.m. in St Paul and St James Church, 57 Olive Street in New Haven. Joining pianist/ composer/ conceptualist Iyer will be his long-time band mates Stephan Crump (bass) and Marcus Gilmore (drums). Other Saturday events include a Master Class in Brazilian Music led by vibraphonist Arthur Lipner (6:15 p.m. in Hendrie Hall) and a 9 p.m. show featuring bassist Matt Dwonszwk & the RGD Trio from 10 p.m. - 1 a.m. in the Saybrook Underbrook Coffeehouse Coda, 242 Elm Street. That's just Saturday - there are talks on Friday and much more music throughout the weekend. To find out more, go to www.yale.edu/jazzcollective/festival.html. The best part? The weekend is free and open to the public! On Sunday afternoon at 3 p.m., The Buttonwood Tree, 605 Main Street in Middletown, welcomes the trio of Frode Gjerstad (reeds), David Watson (electric guitar, bagpipes) and Kevin Norton (drums, vibes, percussion) for a concert of improvised conversations. The ensemble, known as Tipples, released its debut CD in 2010. Gjerstad and Norton had worked together previously on several projects but, upon meeting Watson (who has worked extensively in the "new music" field), musical sparks flew. Middletown residents should recognize Norton for his numerous appearances with ensembles led by Professor Anthony Braxton and bassist Joe Fonda. For more information, go to www.buttonwood.org. Also on Sunday, the Baby Grand Jazz Series at the Hartford Public Library, 500 Main Street in Hartford, welcomes guitarist Sinan Bakir and his Trio for a 3 p.m. The composer/guitarist has recently issued his 2nd CD as a leader, "Tales and Stories", 12 tunes that not only spotlight his fine musicianship but also document his maturity as a composer, arranger and bandleader. The concert takes place in the Library's Atrium and is free and open to the public. For more information, call 860-695-6293.